Infamous doing what he does best, entertaining at the Youth Concert held at Bourryeau Strip. 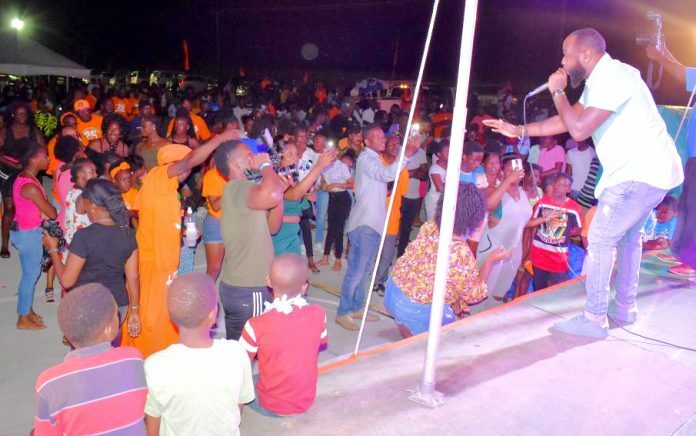 BASSETERRE, St. KITTS -– Hundreds of youths jam-packed the Bourryeau Strip on Dec. 1 to attend the free concert to hear performances headlined by Infamous, Byron Masiah, I-Mark, Nicha B, Vicious Styles and EaseOut. The open-air concert was organized by a nine-member team of the Youths of Constituency Number Seven Peoples Labour Party (PLP); in conjunction with the Planning Committee for the 25th Anniversary Celebrations to mark service by Member of Parliament for Constituency Number Seven, Prime Minister Dr the Hon Timothy Harris. The concert was hosted by McDamien ‘Cuttoe’ Liburd, managed by Atnil Pemberton and featured DJs Terro and Hellfire on duty. Bringing down the curtains for the event that ran into Sunday morning was the Nuvybes aka Sugar Band. According to Evander O’Flaherty a Peoples Labour Party (PLP) youths spokesperson, the group met and decided on the line-up of performers selected for their appeal to youth. The list was given to the Chairman of the PLP Constituency Number Seven Executive Branch Lenworth Harris. After the event and the line-up of artists were given the green light at the branch level, it was left to the youths to make the final arrangements. O’Flaherty working alongside Ms. Trevlyn Stapleton to make sure the event ran smoothly. It ran smoothly setting a high standard that will have to be equalled when such events are held in the future.